God commanded Israel to observe these feasts and holy days as memorials to the great things that he had done. These are holidays that Jesus observed all through his life. Learn about Passover/Unleavened Bread (April 13, 2006), the Feast of Weeks (June 2, 2006), Rosh HaShanah (Sept. 23), Yom Kippur (Oct. 2), Sukkot (Oct. 7), Simchat Torah (Oct. 15), Chanukah (Dec. 16). See how these special days point to Jesus as the promised Messiah. Includes Hebrew lettering, pronunciation, Jewish calendar, symbolism, and Bible references for the feasts and New Testament fulfillment. Includes Hebrew lettering, pronunciation, Jewish calendar, symbolism, and Bible references for the feasts and New Testament fulfillment. Size: 19" x 26." Pamphlet has 12 panels and unfolds to 33" long. 8.5" x 5.5" folded. 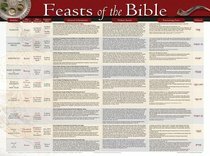 About "Wall Chart: Feasts and Holidays of the Bible (Laminated)"